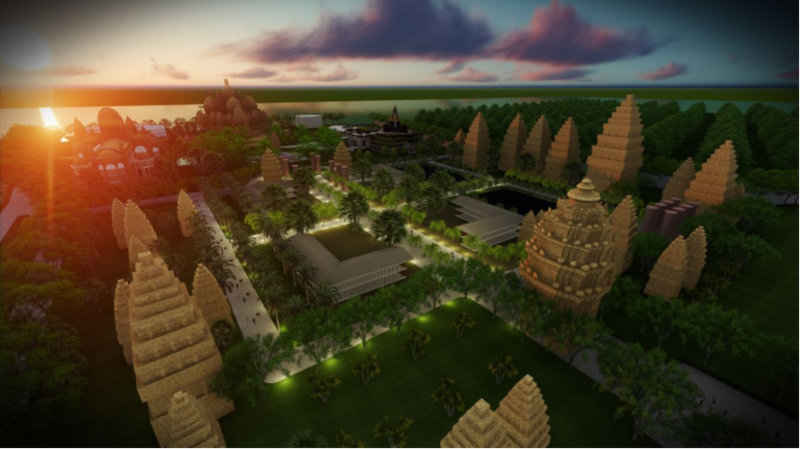 Create a tourist destination inspired by Champa culture. Offer a combination of themed tourism and luxury lodging. Expand their presence as leaders in Da Nang’s Smart Development. Use expert design to create limitless experience. Account for high visitor traffic and ensure operational success. Add to their brand as leaders of Urban Design. Developing this immersive environment within the boundaries of a fast-growing city required a jeweller’s eye for specification and design detail. To insure that this project fit within the proper parameters – legal and operational – we spent over a month developing a Master Plan Design, covering building regulations, traffic flow, operational needs and layout. Plot Ratio/Land Use Ratio – The allowable percentage of a property for construction can fluctuate greatly depending on area zoning laws and what the developer’s objectives are. We ensured maximized land usage within the limits established by governing laws. Height Restrictions/Setbacks — City height restrictions can be substantial. Knowing the amount of allowable airspace, as well as required distances from property borders, easements, etc., helped us push through a city-approved design. Customer Traffic Flow – Every Space Counts. During Preliminary Master Planning, the ability to meet customer traffic demands requires consideration of every available space in effort to best circulate the crowds. Working closely with top Infrastructure Consultants gave us a strategy for space allocation that benefits the Guest Experience. A Well Planned Operation – Focusing on BOH Services adds value. We distinguished ourselves with the level of attention we give to Back Of House Operations. A lack of consideration for services like on-site delivery and maintenance routes, as well as designated employee areas, can cause real problems for future operators. With equal attention given to what the guest does and does not see, future operations are positioned for successful management. Finalizing The Master Plan — Laying the foundation for success. A preliminary massing model for the entire development. Building layout based on their key functions in each zone. Architectural, landscape and grading plans. Themed Design is about offering Adventure-Level experience. This project is not just a city park. Because we were able to put the Preliminary pieces in place within the first six weeks of development, we allowed ourselves to focus on the creative angle of the project during the Concept Design phase. This phase must be devoted primarily to design when delivering The Promised Experience. A coherent theme with a variety of entertainment options. Landscape and hardscape design had to be incorporated in a way that balances the overall feel of the park, as well as building facade details and lighting choices. Endless experience for as long as you stay. The best Themed Destinations can sustain its magic over several days, offering accommodations that allow visitors to enjoy every aspect of the park at their own pace. Thuy Tu Culture Park’s accompanying hotel is designed for families to carry their experience with them and to feel like there are no limits to their enjoyment potential. A day spent enjoying a variety of entertainment, or simply marveling at the architecture and atmosphere, can be complemented by First Class Hotel luxury within strolling distance and away from a modern city pace. Concept Design provides opportunity for success. Recreating a distant time period with a variety of attractions within the boundaries of a modern city presented DDP with an opportunity to apply their skills of precision design and conceptual innovation, delivering to their client what a Theme Park and Resort promises to customers: a culturally rich adventure for every kind of traveler. Covers 38 Ha (94 acres) of Land Area. A 2000 seat Water Show Arena. 30,000 sq meters of Hotel/Commercial Area. 72,400 sq meters of Entertainment Area. A 175 room, Iconic Luxury Hotel. We’re here for you. Get in touch to find out how DDP can make your project successful.